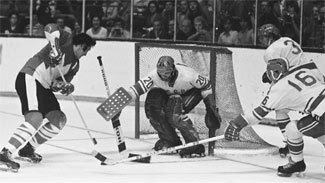 Forty years ago today, the hockey world was fundamentally changed by the start of an eight-game series between national teams from Canada, loaded with NHL players in their prime, and the Soviet Union -- considered the two best hockey-playing nations in the world at the time -- that played out across the month of September. The series was a must-follow for hockey fans across the globe and after its dramatic conclusion --- a 4-3-1 series win for the Canadians -- there was no question that the NHL would never be the same again. This month, NHL.com looks at the historic Summit Series with a month-long collection of content. Today, NHL.com provides a look back at Game 1 of the series from some of those who helped make the history happen. Stay tuned for additional content throughout September. There was no doubt in the minds of the 18,818 fans who packed the Montreal Forum on Sept. 2, 1972, as to what was going to happen that night in the first meeting ever between the National Hockey League and the Soviet Union. The first game of the Summit Series started as if it would be a cakewalk for Canada. By the final siren, the packed house at the Forum sat in stunned disbelief after a 7-3 victory by the Soviet Union. First Period: 1, Canada, P. Esposito 1 (F. Mahovlich, Bergman), :30. 2, Canada, Henderson 1 (Clarke), 6:32. 3, USSR, Zimin 1 (Yakushev, Shadrin) 11:40. 4, USSR, Petrov 1 (Mikhailov) 17.28, (sh). Second Period: 5, USSR, Kharlamov 1 (Maltsev), 2:40. 6, USSR, Kharlamov 2 (Maltsev), 10:18. Shots on Goal: Soviet Union 10-10-10--30. Canada 10-10-12--32. Goalies: Soviet Union, Tretiak 1-0-0 (32 shots on goal, 29 saves). Canada, Dryden 0-1-0 (30-23). For weeks, most media outlets throughout Canada had trumpeted the superiority of Team Canada, a club that had 14 of the top 25 scorers in the NHL from 1971-72 -- though Canada was missing Bobby Hull, who had signed with the new World Hockey Association, and Bobby Orr, whose injured knees kept him out. All-Stars Ken Dryden and Tony Esposito would be in goal. The Soviets -- well, they were a bunch of guys with hard-to-pronounce names that no one had heard of. Their equipment was old, their jerseys were too small and their sticks were worn out. What chance could they have against the best professionals in the world? Halfway through the first period, the answer seemed to be "not much." Just 30 seconds after winning the ceremonial opening faceoff, Phil Esposito put Canada ahead by firing a rebound of Frank Mahovlich's shot past 20-year-old goaltender Vladislav Tretiak -- and 6:02 later, Paul Henderson's harmless-looking shot beat Tretiak for a 2-0 lead. It looked like the rout was on. Canadian players literally couldn't wait to get on the ice and get their crack at the Soviets' kid goaltender -- the only thing most of them knew about Tretiak was that he had been strafed for nine goals by Sweden in a tune-up game (they didn't know the game came one day after his wedding). One spectator behind the Soviets' bench drew laughter from fellow fans when he wondered aloud whether there was a 10-goal mercy rule in international hockey. But the Soviets, who trained year-round, came to North America in much better shape than the NHL players, who in any other year wouldn't even have arrived in training camp yet. As the Soviets settled their nerves and Team Canada's lack of conditioning began to show, the game turned. "I scored the second goal about the six-minute mark," Henderson told NHL.com, "and Ronnie Ellis and Bobby Clarke were going back to the bench with me and I said, 'This is going to be a very long series.' I knew we had totally underestimated them. I knew that we were nowhere near as fit -- we found that out in the first six minutes. These guys' physical fitness was unnerving." Speedy forward Evgeny Zimin took a pass from forward Alexander Yakushev and beat Dryden at 11:40. Vladimir Petrov tied the game at 17:28 with a shorthanded goal, tapping in a feed from Boris Mikhailov on a 2-on-1. By the time the siren sounded to end the first period, the score was tied 2-2 and the Forum was oddly quiet. It got even quieter in the second period, as the Soviets increased their dominance with a style of play completely foreign to their opponents. The visitors didn't shoot the puck in and try to regain it by forechecking, as most NHL teams did. Instead, they kept control, throwing pass after pass until they generated a good scoring chance -- even if that meant circling at center ice before finding an opening. The Soviets' speed, precise playmaking and inventive offense led to an increasing number of wide-open scoring chances as the game went on. "We had never seen anything like it," forward Rod Gilbert told NHL.com. No player on that night was more electrifying than Valeri Kharlamov, who scored a pair of spectacular goals in the middle period to give the Soviets a 4-2 lead through 40 minutes. By the end of the night, Kharlamov would become a household name in Canada. Team Canada regrouped and got within a goal when Clarke scored 8:22 into the third period. But with Canada pressing for the equalizer, Tretiak foiled every chance -- proving that the scouting reports on him weren't worth the paper they'd been printed on -- and the Soviets put the game away with three late goals in a span of 5:05 to complete a 7-3 rout. "We had never seen a transition game like that. Their transition game was unreal. We'd be in their zone and have a good scoring chance, and the next thing we knew -- they were firing at our net. We weren't prepared for that kind of transition game at all. It just killed us." "We stayed with them for two periods, but by the third period, our poor defensemen were just sucking air," Henderson said. "We turned it over in their end and they were gone like a shot. We had never seen a transition game like that. Their transition game was unreal. We'd be in their zone and have a good scoring chance, and the next thing we knew they were firing at our net. We weren't prepared for that kind of transition game at all. It just killed us." The stunned silence at the final siren said more than words ever could. Fans across Canada could hardly believe what they had seen -- the best players in the world had just been destroyed, even embarrassed, by a bunch of "amateurs." Instead of a cakewalk, the NHL players had taken a pie in the face. Even the Soviets were surprised -- after all, they'd been told how great the NHL players were and came to Canada believing the hype that said the NHL pros would win easily. But they had been practicing together for months, and their teamwork and superior conditioning meant that they were far better prepared for the first game of the biggest series in hockey history. "This was a big project for them," Gilbert said. "We had no idea how good they were, and they were in a lot better shape. We knew it was going to be a lot harder series than what we thought it was going to be." Henderson said, "They'd had that team together for two years -- that was a two-year program. They had played together for two years, and brother, were they ready!"